before we begin the journey of opening up the space to the public, we are invited to come play and explore and learn about this new world of which we will soon be a part. i am, at first, struck by the massive size of the Wade Thompson Drill Hall. somehow, i had never been to the Armory before. so what a way to greet it, knowing that i will be somehow responsible for filling this grand space with my humble presence. and then i see the beautiful, billowing curtain. it looks to me like the giant wing of a dove, entrancing me to enter and become wrapped into its sense of flight. i notice that there are caged pigeons on the table. it is both curious and inviting. i get the sense that this Lobsterbird belongs in a space just like this. next come the sounds of laughter. as individual figures start to solidify into my field of vision, i see Leon, Ellen, Barney, and J.Ed. There’s Ann and Anne, discussing some of the dynamics of the exhibit. Tina, Jeremy, and Brent are the recipients of big hugs. Sonia is staying in my apartment and i never get to see her. but she is here too! everyone is swinging, laughing, taking photographs, and pushing each other on the swings. there is a great feeling of mirth and reunion. i look around, knowing that my dear collaborator Davina is somewhere in here as well. grad school has caused a somewhat painful separation between us and i am both anxious and excited to see her again. and then we meet on a swing built for two. Gabel comes by and asks us if we want a push. “can you push us with your beard?? ?” Davi playfully asks. it seems that he does and we laugh and embrace and soar with glee. i can see no better way to be reunited again. afterwards, we are taken on a tour of the Drill Hall—the bunker where we have our green room, the racks of beautifully hand-crafted jackets that we will wear during our shifts, the specific way that we are instructed to take our places and leave of our duties. the placement of our water glass is so specifically detailed, while the way we read is only given a few guidelines that could easily give way to interpretation. but it is clear how much thought and consideration has gone into every element of the piece. Ann Hamilton is an artist that exudes a quiet, yet powerful sense of kindness and thoughtfulness. there are few that i have encountered with this kind of visceral gravitas, but their brilliance has always left a lasting impression. i don’t know what my face is doing, but there is a smile stretching out my heart and making room for more love. i am listening so intently to her words that it seems all other sounds are miles away. 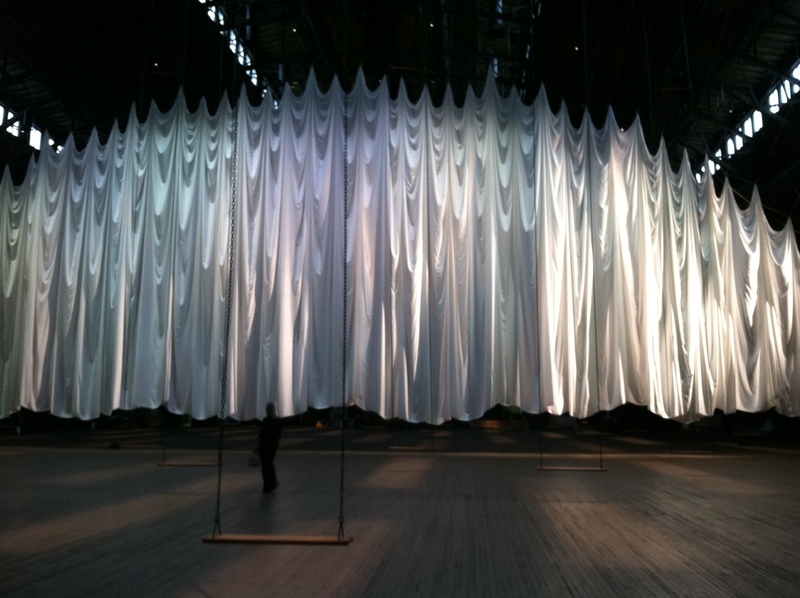 : Ann Hamilton discusses the changing of the guard. with Barney O’Hanlon and Akiko Aizawa of SITI Company. i feel ever so grateful to connect with the energy of this space that she has created, with dear collaborators and mentors in this way, and with the deep knowledge that i am a part of something meaningful. i am slightly confused as to what exactly our role is, but i get the sense that we have the time to figure it out as we go along. there is a lot to be discovered in the doing of it. there is great generosity in this allowance. i am excited for this opportunity, even if there is much of it that i do not yet understand. that is the best way i have ever had my life described – here’s to us all dancing and dreaming together! xo!